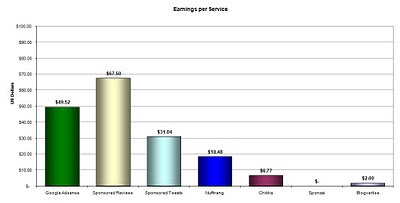 Hello everyone and welcome to the July 2010 edition of my Online Earnings Update. Nuffnang.com.ph - Php1.86 - Last month I didn't get anything from Nuffnang. This month I got a little bit. :p Still I am optimistic that I will be getting that payout Php 2,000.00 before the year ends. Woot! Sponsored Tweets - $1.86 - Can you believe that at one point a few months back I actually earned almost $10 from Sponsored Tweets in one month? Nowadays, opps are hard to come by. Maybe it has something to do with Twitter's moves to create their own Twitter ads service? I don't know, but whatever it is, it has definitely affected this service's income generation capacity. Chitika - $0.42 -Picking up? Picking up? Gah. :p Another month, another month. Sponsored Reviews - No opps received this month. But so far, I've earned a total of $67.50 from Sponsored Reviews since I joined in Feb 2010. Adgitize - I've decided to finally let go of Adgitize. I have no time to manage it anymore. I will now be focusing on the 3 MMO services above. And maybe Social Spark. Social Spark - This service is not new, but they revamped their look and are starting fresh, getting everyone to register on the new site. From January to July 2010, I have collected a total of $176.98 (roughly Php8,400.00 in 7 months). That's an average of about Php 1,200 per month in 2010 compared to an average of Php 135.00 a month in 2009 (a 790% increase). Hehe. But stil way below minimum wage, eh? Haha. Still hoping to get my first Google Adsense and first Nuffnang paycheck before the year ends. April 2010 - "Earning 10 in 2010" - April Online Earnings Update! So what did I learn this month? I learned that it becomes frustrating after a while if you maintain so many Make Money Online services. I think it is better to choose a few and really work with them. I have recently declined an opportunity. I didn't agree with what the advertisers products endorsed. It's OK to refuse opps. You have to accept that sometimes you will earn a lot, sometimes you won't earn anything at all. If you cannot afford to not earn anything, then this blog series is not for you. :p Maybe try looking for tips from full time bloggers. What did you learn this month? Share tips and tricks with us!